This is the way the world works.... You never know what will come from your reaching out to help another Jew to find his way within Torah and mitzvahs. The young American Chassidic man pictured here is getting married next week. Mazal tov. He will learn Talmud fulltime in a Chasidic Kolel. He is doing wonderfully well, B"H.
If you look at my video, G-d Said, "Be Holy-Eat a Matzah" G-d Said, "Be Holy" (a little after 2 ½ minutes in) you will see him as he looked when I first met him some six years ago. He was not yet religious, not at all, but he enjoyed the way I showed him what Hashem has given us. What Is a Jew? 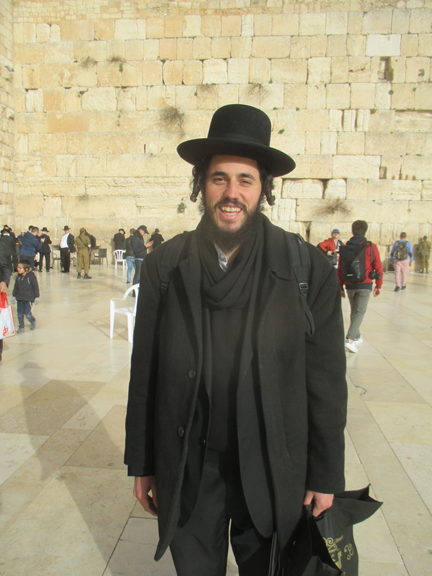 He says that I was the first to help him with tefillin and moved him to turn to the ways of Hashem. Now there will be a Jewish family instead of who knows what would have been. He and his family will be a blessing to the Jewish People. It is a blessing to be able to help someone, and it is an additional blessing to see that you were able to help someone.